I've said it before, but it bears repeating. Price Chopper is my favorite grocery store of all time. I decided to try grocery shopping with John while Sam was in school today. It was an ill-advised idea. Shopping without a toddler in tow is a whole lot easier in principal--and today I needed the room he was occupying in the shopping cart! I bought so much stuff I had the entire bottom rack of the cart filled, plus had a pyramid of groceries in the cart that kept falling out. 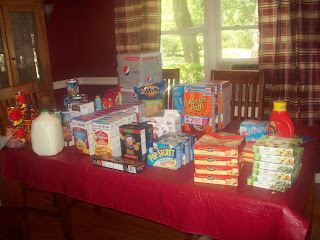 It was a great couponing week and I stocked up! We will be drinking Diet Pepsi, and eating soup, chili, boxed potatoes, Hamburger Helper, popcorn, Stouffers Paninis, and Green Giant vegetables well into the New Year. I'm surprised the dining room table didn't collapse under the weight of all those goceries. With my advantage (store) card I saved $84.67. With coupons I saved (Are you sitting down?) $108.51. For a grand total of $136.85 and a savings of 60%. Today shoppers paid attention when I showed up at the store with a huge fist full of coupons. They asked me where I got them all (combination of the Sunday paper inserts, coupons.com, redplum.com, facebook.com, magazines, etc.) and even the poor woman who had the misfortune of standing behind me in the check out line couldn't believe how much I was saving. She and the check out lady were both amazed at my grand total. But there is a cherry (and some whipped cream and some nuts) on top of this shopping sundae of joy. After I checked out, I got a small stack of register coupons (catalinas) that are going to save me some more money next week. $3 off my next hamburger, chicken, or tuna purchase from General Mills, $2 off my next purchase, and another $2 off my next purchase. I used to not save these. You can bet I will now! On top of that, I've earned .50 off up to 20 gallons of gas at Sunoco with my store card. 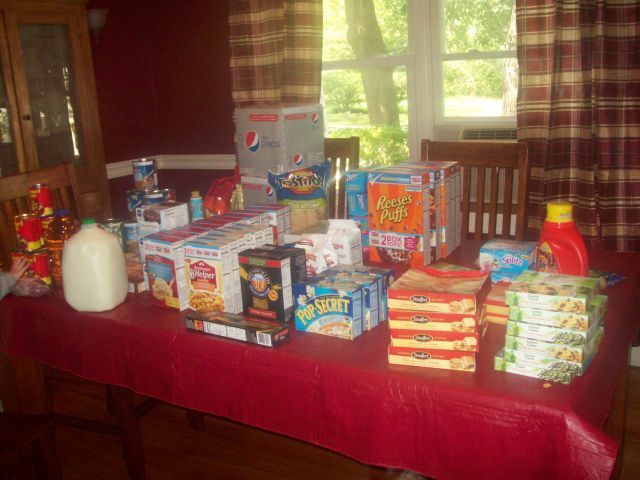 And since I bought 10 boxes of Betty Crocker Potatoes, 6 boxes of Hamburger Helper, and 5 boxes of General Mills cereals, and made sure I picked up the packages with 3 Box Tops for Education on them, I now have 63 Box Tops to give the school of my choice, which gives them $6.30 to put toward a school purchase. It's not as bad as it seems. It is time consuming, especially at first, but if you don't clip the coupons from the newspaper inserts and just devote an hour or two to matching the coupons in them to sale flyers each week, you will still see some decent savings (20-30% I'd guess). Every little bit helps. I never really thought about just buying the stuff I have coupons for. Maybe I need to go about it that way. You've got a pretty good system going! Very inspiring! Great job Brittany! Isn't it a rush?! Wow that is a lot of stuff! Sounds like you are in the swing of couponing now like a professional!!! I am amazed how much you can save with doing it!